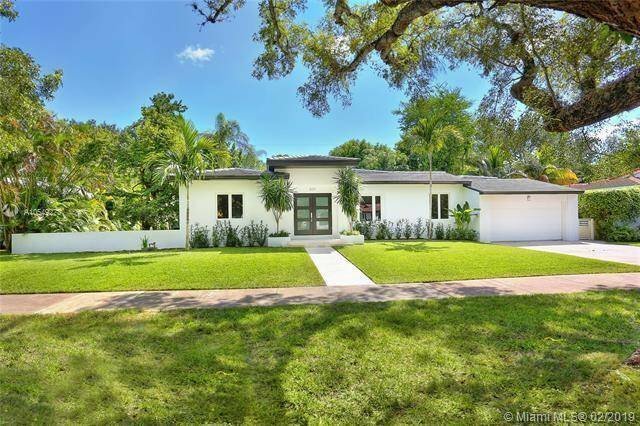 Ideally situated in the heart of the Gables on one of the prettiest streets w wide swale, & just steps to the Biltmore, this is your opportunity to buy a virtually new construction home. Taken down to the studs, it was redone w/ the finest finishes & modern layout including new wd floors, impact wndws & drs thruout, open kitchen w/ marble counters, Italkraft cabinets & top of the line appliances, including gas stove & wine cooler. The kitchen opens to fam rm that overlooks the lovely & private backyard & new pool w/ large sliding drs. The master BR is the epitome of lux w/ a peaceful view of yard, built out closet & modern bath w/ fabulous shower & free standing tub. The elegant frml liv & din rms are the heart of the home w/ 3 add l BRs, 1/2 bath, butlers pantry, laundry rm & 2 car gar.